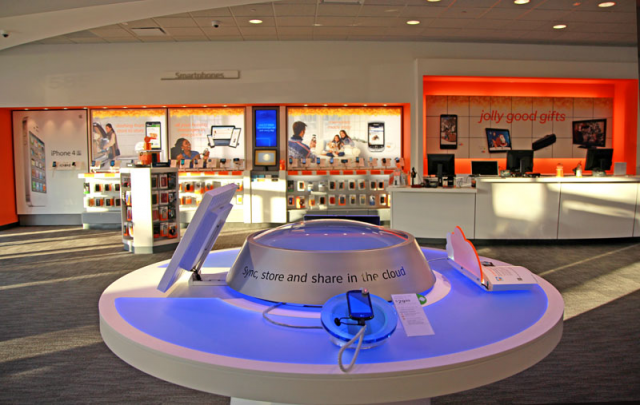 Coming to a shopping mall near you this weekend (if you happen to live in suburban Chicago) will be a concept store from AT&T, aimed at offering consumers a more comfortable retail experience. According to an AllThingsD report, the new store, located in Arlington Heights, is about twice as large as the majority of its regular retail establishments, covering around 10,000 square feet. It’ll feature two giant touchscreen walls and from early next year will devote a whole section to the demonstration of what it calls “emerging devices,” such as the Jawbone Jambox wireless speaker. Roth even admits that part of its concept store, with stools set around tables laden with new devices, together with a special area where visitors can get one-to-one advice, may look familiar to some. “The name ‘Genius Bar’ was already taken, but that’s what it is,” he said. The retail president added that with its business rivals all selling essentially the same products, the retail experience offered by each company would become increasingly important for consumers. Open space inside the store has been increased by doing away with the usual row of cash register terminals, and staff will be free to move around and interact with customers more, with product information only a swipe away (they’ll be equipped with iPads). Hang on, this is sounding more and more like an Apple store with every sentence. 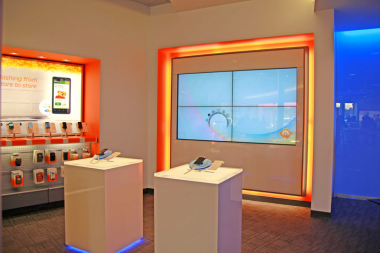 AT&T sees its concept store as a testing ground for new ideas, with ones that prove popular likely to be rolled out nationwide. With the likes of Verizon and Sprint competing for the same customers, perhaps AT&T’s store in Arlington Heights will come up with the goods to keep it ahead of the game.